Mike and his band are amazing! They were very flexible when it rained on our big day and things on the schedule changed. The music was amazing and got everybody up and moving! I had so much fun with my friends on the dance floor and wouldn't change a thing. They make the planning process easy and are always there if you have any questions. We would definitely hire them again. Our wedding would not have been the same without Cover Down Band. They are an exceptional band and I am so happy with everything that they provided. We loved working with the Cover Down Band. We thought they were affordable and provided top of the line service. They had our guests on the dance floor the entire night and we received countless compliments about how fun the band was and how much people enjoyed the set list. Thank you Cover Down! Cover Down was AMAZING! They made my wedding reception so memorable and everyone talked about how great it was. I am so glad I found them! The Cover Down band was the life of our wedding reception (in November)! We were relatively anxious about hiring a band unheard, and luckily were able to hear the band play - Danny, Katrina, Mike, etc. - at a local bar about 2 months before booking them - We were sold within the first 10 seconds of hearing them - they have an incredible energy and fantastic talent. From the first point of contact, Mike was clear in his communications, professional and easy to work with! The day of, of course, we had changes and the band was very accommodative and to this day, we get so many compliments on their performance and energy! Couldn't have asked for more! 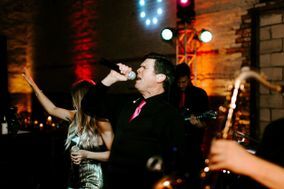 My husband and I are big music lovers and it was one of our top priorities to have a great live band at our wedding. We wanted a band that was affordable and offered DJ services as well, but most of all we wanted a band with a great song list. Cover Down was perfect! My husband found the band and handled most of the communication since music was one of his "wedding tasks." He said Mike was professional, quick to respond, and very easy to work with. He had a pretty laid back style, but anything we asked for was no problem. The band clearly has a lot of experience and didn't need any hand-holding. They were also willing to drive from Plano to Tulsa (where our wedding was held) at no charge! We asked the band to act as emcees in addition to providing entertainment, and they were great about double checking the pronunciation of our wedding party and toasters' names, which was nice. They also provided lighting and all of their own AV equipment. The lighting was enough to enhance a very large ballroom (we also had a separate uplighting vendor), and the colors and patterns from Cover Down's spotlights made for some amazing photos. But of course the best part was their MUSIC! Cover Down played all of our favorite songs and nothing from our do-not-play list, and our guests had a blast! We have so many great photos of guests dancing up a storm, and at the end of the night no one wanted to leave! Good thing we had an after party! We had worked with Cover Down for two previous parties, so when our daughter became engaged, one of the first phone calls we made was to reserve the band for the reception! We knew that the reception would be unforgettable if they provided the music. Of course, they did not disappoint! The reception was so much fun, that people were still dancing when it was time for the bride & groom send off! The band has a gift for reading the crowd, and plays music that keeps people dancing. You know it's going to be an amazing event when Cover Down is on the stage! Thanks a million to Cover Down band for helping us realize our vision of an unforgettable wedding reception on Saturday, September 26, 2015. Our top priorities were GREAT live music and happy guests who were dancing and having fun all night—and that’s exactly what we got! Coupled with the endless compliments from our guests, we simply can’t recommend them highly enough. The band was the perfect combination of talent, sophistication, and fun. With a long year of planning and the wedding now behind us, we’ve had a chance to reflect on everything we did and everything we spent. We can say with absolute certainty that this was the best money we spent and that we’d hire Cover Down again without hesitation. Our point of contact, Mike, was so professional, accommodating to special requests, and a joy to work with in helping make our dream reception a reality. Even though we really loved what we saw and heard when we previewed the band at a public performance, we still couldn’t have fully imagined how incredibly essential they would be to creating the perfect vibe and energy we wanted to achieve. So if you want to guarantee that you’ll have great music and dancing guests, do yourself a favor and hire this band! !